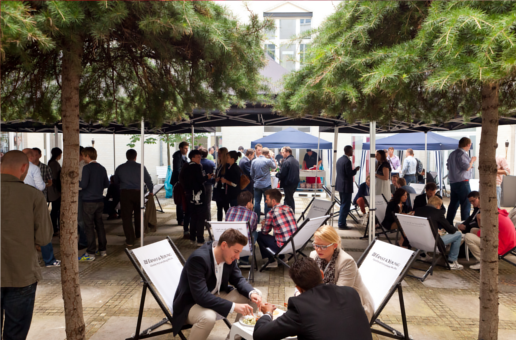 The hard numbers – over 400 guests, 300 steaks, 400 bratwürstchen, 30 kilos of potato salad and a heavy stash of gold coins, quickly swapped for beer, wine and free-flowing prosecco. One iPad, won by Andrea Kowalski of Boost & Co in our draw (sponsored by Link11) after the first two lucky names couldn’t be found, and one well-known name who tried to sneak in without a ticket and got booted after a scuffle at the door. Rocket Internet‘s new head of PR Andreas Winiarski and international innovation explorer Francis Pisani (“journalists are dangerous people”) took a deep breath and stepped into the speed-networking room, alongside plucky reps from Sponsormob, eVenture Capital Partners, Anwalt, Zurich startup Rayneer, Waymate and dozens of others. Sorry to those who turned up expecting speed-dating – maybe next time? The night wrapped with a round (or two) of vodka shots, courtesy of late shift regular and Team Europe co-founder Kolja Hebenstreit. In the words of Roomsurfer community manager Monica Zaldivar aka @smonicats, networking can be such hard work. Thanks to everyone who came and made last night a success – we hope we’ll see you at edition #4 in October. Video highlights coming soon! You can see the full album of snaps (and tag as you like) on our Facebook page.